Fundamentally, there has been serious concern about the structure of the political system that we run in Nigeria, and as we are in an electioneering year, there’s been a lot of talks going on about that. One of the major political parties, that is, the PDP is pushing restructuring in a more active way than the ruling political party, the APC. What are your thoughts on the structure of the – I hesitate to use the word federation – Nigerian federal government? I don’t think either of the two major parties is serious about restructuring the polity and the polity needs to be restructured because we are not running a truly federal system of government in Nigeria, unlike the federal government Nigeria had before independence and after independence. When I say before independence, let me explain myself.Under the colonial era, Nigeria was run as three separate colonies from 1900 when the protectorate of Southern Nigeria and the protectorate of Northern Nigeria were proclaimed as British colonies, colonies in inverted comma; along with the existing colony of Lagos, which Britain had or had acquired for itself in 1851, but each one had its own cabinet, which was set up separate from the other – the Colony of Lagos remained as a colony in Lagos sense until 1st October, 1960 when Nigeria became independent, because all people and everybody born in the colony of Lagos, being a colony, was a British citizen with British passport, and had the right in any part of the world as an ordinary British citizen in UK. But those born in the protectorate, which came under the British umbrella, political umbrella, on 1st January, 1900, were British subjects or British protected persons. They didn’t have the right of British citizen outside the Southern or Northern protectorate unlike those born in Lagos had anywhere in the world. I’d give you an example, a personal example. In 1962 when I still had my British passport with me, I and a colleague of mine, political friend, political colleague, Dr. Tunji Otegbeye represented the Nigerian Youth Congress at the All African Youth Conference organised by the late Dr. Kwame Nkrumah in Tunis, capital of Tunisia. And we travelled, both of us by Alitalia overnight, because there was no direct flight at that time, between countries in Africa. We went to Rome overnight; we got there very early in the morning. The flight to Tunis was to take off in the evening; with my own British passport, I went out of the airport, I had a tour of Rome, [but] Tunji was confined to the airport, he couldn’t leave the airport because he carried the passport of a British subject or British protected person. He wasn’t a British citizen. So, anybody born outside the colony, which is synonymous with the present Lagos State – Lagos colony included Epe, Ikorodu, Badagry and of course, Ikeja. The same as it was in those days. So, that gives you the difference between somebody from the colony and Tunji was born in Ilaro, now in Ogun State. That’s the sort of privilege. The difference continued until 30th September, 1960 when the following day, Nigeria became independent and we all became Nigerian citizens. And the colony retained its own independent government; you can call it local government, until about 1950/1951, when the office was grounded. But as a colony – Lagos remained a colony of Britain; the rest of the country only protected by British might. The north was one administrative unit of protectorate until 1947; the south was run from 1922 as the Colony of Lagos and the protectorate of Southern Nigeria under one constitution, which excluded the Northern protectorate. That was the Clifford constitution, which set up a legislative council with three elected members from Lagos — franchise, and then one from Calabar; but that constitution was only for the Colony of Lagos and the protectorate of Southern Nigeria, until 1946 when, after the Second World War, Sir Arthur Richards, who became Lord Milverton, and later became the Governor of Southern Nigeria, broke up the Southern protectorate to be called Southern region and Eastern region; and the Northern protectorate remained as one, but now named Northern region. And Lagos remained as a colony, Lagos Colony. That’s the present Lagos State, more or less. Well, under the 1954 constitution, that’s the Littleton constitution, the responsibilities evolved, responsibilities handled by the various regions; the Federal System was established at that time, and that’s why we have the Federation of Nigeria. In fact, the constitution was the Federation of Nigeria, Constitution of the Federation of Nigeria 1954. Now, 1954 was very important in our political history, even though we’re still a colony of Britain in general terms, powers were divided between the federal government and the regional governments. For the first time we had powers, which were made exclusive to the federal government and other powers, which were concurrent, that was quickly bringing the concept of federalism to the governance of the country. That pattern remained until more or less 1979. Before we go further, we all agreed about the concept the meaning of federalism. In political terms, federalism is a division of powers, or functions, or matters as an organ, between the federal government or central government and the federating units. It makes governance as simple as possible. The federating units, call them regions, as they were in those days, call them states, call them provinces as in Canada, the idea is for the various federating units, state, region or province to sit down together, each of us cannot run an independent government, right? And we don’t want to anyway. Let’s have another at the centre to which we all will surrender certain functions to perform on our behalf. And we’ll have other powers which each and every one of us will share with the federal government. The whole thing is very simple, federal government or central government does functions like defense; each of us doesn’t want to set up our own armies and navies, air force and so on. Banking, exclusive to federal government; currency exclusive to federal government; external affairs, immigration, emigration, citizenship, to be one country, one people and so on. So all these functions or peers are clearly stated in the constitution, exclusive to the federal government; and there were other powers, like housing. I wouldn’t put housing there as stated in the constitution, are concurrent powers, which both the federal government and state governments can discharge. That’s the concept of federalism. If you look at what one of the leading authorities on federalism, Professor Kenneth Wheare, said, federalism consists of a division of functions of government between an independent common authority for the country – that’s the federal government, and the independent authorities for the constituent parts of the country; those in simple terms are states, provincial or regional. It’s provincial or regional governments that sat down and said, look we can’t do this on our own, let’s have the central authority. So, all the talk about LG being the third tier of government is not on, that does not define federalism, at all! But it would appear, in the case of Nigeria, as if the states, or regions or provinces haven’t come together or sat together to say we are a federation. They did. I want to remind you about the Ibadan conference in 1950, when the delegation of people from the Northern region was led by the Sardauna of Sokoto, and [Obafemi] Awolowo led the delegation from the Western region at that time, that was just before Action Group was formed and just before Northern People’s Congress was formed in the north. And the Eastern delegation also; Zik [Dr. Nnamdi Azikiwe] was in fact, for them. They all met at Ibadan, and that was when the Sadauna said, if the north with the largest number of people in the country – did not have 50 percent of the population in the legislative council, the mistake, quoting him, not verbatim, of 1914 would not be repeated, and was prepared to walk out of the conference. And when it was settled later, the north had 50 percent representation in the Legislative Council. At that time, John McPherson was the Governor, from 1948 to 1954/55. Until 1960, when we had a new constitution – the work was on the Independent Nigeria – 1960 constitution. But there was consultation by the various leaders before independence to fashion out the 1960 constitution, they decided which powers should be exclusive to the federal governments and what powers should be retained by the state governments – the federating unit. That represents the ideal situation since they all came together and reached a decision. At what point then did the essence of federalism in Nigeria go awry? That’s a very good question; before independence, and until the first coup in 1966. Let me correct myself, until 1979. The political leaders, before the coup and the military governments of General [Yakubu] Gowon and even the military governments of Generals Murtala [Mohammed] and [Olusegun] Obasanjo jointly followed, almost religiously, the concept of federalism in terms of division of powers as laid down in the 1960 constitution, the political parties, unfortunately at that time, were confined to their regions, Action Group in the western region, NCNC – national in character but more powerful in Eastern region, Northern region was the base for Northern People’s Congress – NPC. These were very effective in implementing policies enunciated by them; Awolowo led the way at the time in party manifesto, health – public health, primary health – has always been the state function and its division of revenue, which suited those who produced this revenue, enabled them to have funds to run primary health without interference from the federal government, because it was a function not included in the exclusive legislative list. Housing and other areas, which are not in the exclusive legislative list, are land, all these are not, agriculture, there are all technically regional subjects. They have the resources from each of the resources to fashion out the plans and they did this effective – free education, primary education which was a state matter, secondary education which was also basically a state matter; it’s only higher education, University. Even then, university was concurrent. So, Dr. Nnamdi Azikwe was able to set up University of Nigeria; Chief Awolowo, in fact, was the first in that area, University of Ife; and Sardauna of Sokoto, Ahmadu Bello University; and then the University of Lagos and University of Ibadan, were federal institutions. So, each organ, whether federal or regional, was able to run its government at its own pace. And they did it beautifully and in competition with one another. Things went wrong, to my mind, in 1979, with the 1979 constitution. Things went wrong because take revenue allocation, for instance. Revenue allocation before independence was more or less in this formula, those regions which produced certain commodities or minerals profits from these commodities or minerals: 50 percent of the profit went to the state of origin. 20 percent went to the federal government to manage its exclusive legislative functions, then 30 percent was put in a distributive pool which was shared again under this formula – (40 percent from the distributive pool went to the northern region because the northern region had more than half of the population of the country and in terms of size, two-thirds of the size of the country; so population really was diffused, not concentrated as in the south, so north took 40 percent of the distributive pool, eastern region if I remember 36 percent, Western region took 24 percent, and when Midwest was created, the formula was 18 percent, and six percent for the new Bendel State). So, from profits from commodities like cocoa, 50 percent went to Western and Midwestern regions. In fact, cocoa also grew in part of the eastern region, so whichever region cocoa was harvested, each of them will take 50 percent profits under the revenue allocation formula. Palm oil/Palm Kernel – are areas where Nigeria was number one and number three when I was in school in those days; number one and number three in the world. Not as we are now, nowhere. Eastern regions where the bulk of palm oil, palm kernel grew took 50 percent, so the formula followed as I’ve just stated. The northern region had cotton, had groundnut. The famous groundnut [pyramids] in Kano, for example; they had tin in Jos, again the same pattern and with the money derived from the sharing allocation system or formula. Each region had sufficient money to run its function under the constitution as efficiently as it wishes to. The federal government had only 20 percent. But under the 1979 constitution, that’s where the trouble started, the revenue allocation was put aside. And it was left to the whims and caprices of members of the legislative council. The House of Representatives and the Senate were created by the constitution to determine what should go to the state of origin and what should be held by the federal government. The formula was zero. And that’s where the problem of revenue sharing is. And then, just before 1999 return to civilian rule, the military government as at that time, grudgingly conceded 13 percent to state of origin under that formula and the federal government kept the rest. Now, what they do under the 1999 constitution, 13 percent for state of origin; federal government now takes 52-54 percent, from these profits or revenue for itself and under the guise of local governments, they have the balance shared out, including what they call “Local Government,” which is another aberration. So, states, which used to enjoy 50 percent revenue from products or produce emanating or derived from their states, have only 13 percent – they have no money – to run the governments, which remains more or less the same, under the ‘54/’60 constitution, has up till today, primary education, primary school is still a state matter – the areas which requires lots of money. Primary health – a lot of money is required there, the states don’t have the money because the federal government has taken, instead of 20 percent under the 1960 constitution, which was repeated in the 1963 constitution, 52% – 54%. Let me put one issue at rest about the military government taking this money. The military government in which I served, with Gowon as the head of state, retained the formula of old, only 20 percent accrued to the federal government, 50 percent to the state of origin. Bendel State, with General [Samuel] Ogbemudia, continued to take 50 percent revenue from oil, from on-shore; [Alfred] Diete-Spiff, he’s still alive, as Governor of old Rivers State, received 50 percent revenue in my time in government. The difference was off-shore, which was just beginning to yield some money. By a Decree in 1970, 100 percent revenue went to the federal government. Let me also emphasize one point, the functions of the federal government, the exclusive functions didn’t change much – more or less the same in 1950, more or less the same in 1953,which was just from being government under the British Crown to being a Republic. These functions, up till today, haven’t changed much. So, federal government takes all, more or less, leaving peanuts to those who really produced this wealth. That’s why the state governments today don’t have much money to run the heavy functions, including housing, primary health; some of them run university hospitals, run other heavy functions, which affect the ordinary person. I want to ask two questions. First is to ask you how much has this distorted the Nigerian federation? And secondly, do you see a duplication of functions as it stands and how much is that a hindrance to progress in this country? Greatly! It distorted the federation completely. I said earlier on, the state government which, for products within the state use to have some profits derived from the sale of these products, 50 percent, now receives only 13 percent. It means a drastic reduction in the income, statutory income of this state, it means from 50% to 13%; they’re impoverished, and they have no money. They use to depend on this money – in the case of Eastern region, from the sale of palm oil/ palm kernel where they are dominant and partly because of indolence of Nigeria to make the economy only to be based on mineral oil and abandoned agriculture. As we know, we now buy palm oil produced from Malaysia, and Malaysia in those days in the 60s came to Nigeria to buy palm kernels to experiment in their countries. It is Malaysian oil now which is sold on the streets in every part of the country. So, that is also a contributory factor, but revenue allocation, the revenue sharing allocation within the state with heavy functions and the federal government, which has fewer functions. There is also this problem, over time, over the years federal government has stolen some of the state functions. They’ve taken away from the state some of their own functions. They are interfering with primary health, for example, as I explained earlier. They are interfering also with housing; housing the people is not their business under the constitution, it’s not their function. It’s exclusively for the state. What I did in my time in government was to create a system whereby people could borrow money, more or less nationalize the Nigerian Building Society, which was wholly owned by the British Government, an agency of the British Government, CDC, Colonial Development Corporation. I took away their 40% for the federal government and in due course of time, building society became the Federal Mortgage Bank. I created the Federal Mortgage Bank, with all humility, and it was for building and raising finance for people to borrow money, not for construction of houses. There are those areas which government has not opened up or taking over of some of the functions of the state, and there are some situations where it has out-rightly created others but in terms of fiscal federalism, that was until 1979. Fiscal federalism still suffers from heavy hemorrhage, heart attack, it has not recovered from. Do you now make a case for consideration of the present revenue formula? We should go back to the old formula. We should go, Nigeria should go back, and that’s part of the cry for restructuring. We should go back to the old formula where the state of origin takes 50% of the revenue. And the other states would take their own from the distributive pool; that is, those who don’t produce the particular commodity. And that will put an end or at least help in putting an end to this, what has become a fashion of governors marching to Abuja to beg for money – the begging bowl. The revenue which used to belong to the state or regions has now been taken away from them by the federal government. That’s the problem, that’s a failure of fiscal federalism in Nigeria. As we all know, they march down, they have little money to run their state. Meanwhile, federal government, more or less is saying functions, apart from those other functions, had stolen from the states, taken away from the states in parts or whatever. Right now the federal government sits on 52-54% instead of 20 as before, that’s part of the problems we face in the economic structure of the country. As much as this sharing formula totally touches me, what about some states that actually do not, maybe, have any commodity? You do these from two angles. It’s a myth that most of the states or all the states from the North benefits from the present formula and they don’t want restructuring. I ask what about those states in the South – the former Western region like Ekiti, like Ondo, like Oyo, which have no oil. How about states in the former Eastern region who don’t have oil. Most of the oil producing states are in the Delta, Enugu has no oil. Ogun has no oil. That’s one side of the story. You look at it also from this point. Why don’t the states without products develop other sources of wealth Nigeria is blessed with? We’ve been told that Nigeria has untapped minerals. Every state in the country has some minerals which are untapped. When I was in the constitutional conference in 2005, one of the papers circulated to us shows very clearly that every state has some untapped minerals. Every state has land, anyway, why don’t they go into agriculture. Right? Agriculture. Revive agriculture. Cocoa industry is virtually dead. Palm oil/palm kernel is virtually dead. What has happened to all these agricultural produce in the country? Nigeria is blessed with wealth, if only our political leaders concentrate on these areas. So, my own plea is that the political parties, especially the major political parties would state clearly where they stand on the issue of restructuring the polity. Are you for return to old revenue sharing formula or you’re against it. They should state clearly. Former vice president Atiku carrying the PDP flag and the present president Buhari should publicly declare whether in support of restructuring the economy or not. Is not just enough to have general declaration on restructuring, what exactly do you mean by restructuring? Are you going back to fiscal federalism as it was known in Nigeria before 1979. Are you in or you’re not? That’s the key aspect of restructuring the polity, the economy of the country. There are some other areas of re-structuring which I will very much like the two parties to declare their stands on very clearly. Local Government is not a federating unit in the country. Before 1979, I’m being bold to say that, Northern region, northern states had their own system of local government, which worked effectively up till that time. Western region had its own Oba in Council, in form of local government, democratising it, making the Oba chairman of the council but effectively the chairman of the council had the power in line with the council. Dr. Nnamdi Azikwe and Dr. Okpara, had theirs in the Eastern region, borrowing more or less the British system of local government. So, local government is not of the federal system, It doesn’t count within the federalism – Local government is how you want to divide your state for effective administration within your state. Whether you ant 20 local governments or 100 local governments or two local governments is your business, and should not be the business of the federal government. That is an area where federal government is coming to distort federalism. Lagos had it’s own Mayor, Dr. Olorunnimbe was mayor of Lagos, Mazi Bono Ejike was deputy Mayor of Lagos at the time, that was in the glorious years of Nigeria as a people, and Lagos was the example of that – to teach the country that we can run an effective government as one people. An Ibo man as deputy Mayor in Lagos, populated largely, by Yorubas. Incidentally, Dr. Nnamdi Azikwe, a great African before Nkrumah and of course Mandela, was first Lagos elected member, elected by the Yoruba population to represent them. Where would you find that in Nigeria today? Not even in Enugu where Mallam Altine of northern region became a Mayor of Enugu. Not today. The Nigeria I dream or I used to dream of, and I still plead you young people will create, was one and it is one in which a Lagos man can be governor of Sokoto and the Kano man can be the governor of Lagos, while the Ijaw man can be the governor of Ebonyi or Ekiti; where the Ondo can be the governor of Kwara or Jos, Plateau. The argument for an autonomous local government is that they are closer to the people and they can facilitate development easily. That is wrong; the state government is closer to the people, [and it’s] for the people. The state government can create all these local governments for efficient administration of the state, but local governments are not units of the federation. They’re not. You distort the meaning of federalism when you say local government is an element there. It’s your own headache, it’s your business. The late General Murtala Mohammed destroyed and created this problem in 1976. 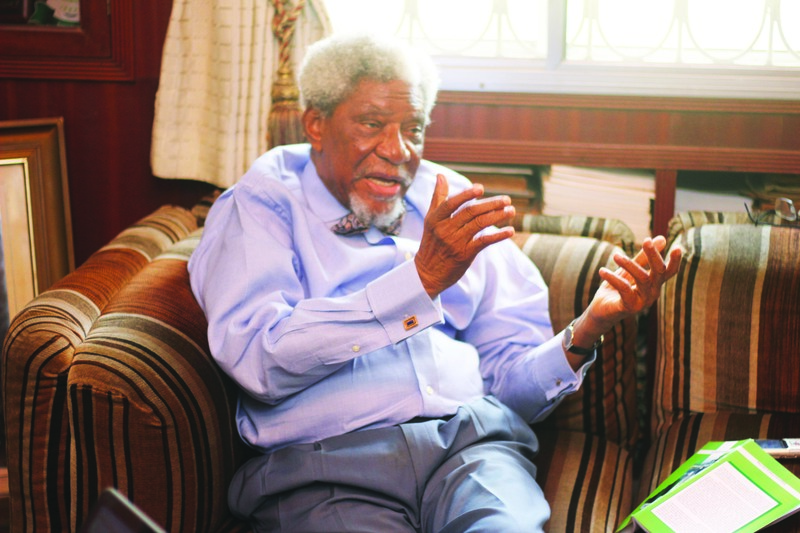 In fact, I was told by one of the secretary, whom he dismissed later when I accused General Obasanjo at an Abuja conference in 2005, that Obasanjo promoted, “You started this problem.” And the late Damcida, called me and said “Look Femi, you’re wrong. A member of the committee set up by General Murtala Mohammed almost a day before his assassination, a committee for local government reform system in the country was to distribute a draft- local government edict. They didn’t do the actual distribution, it was done after his assassination but he prepared it. And to unify the local government system in Nigeria, as against what’s there, each region has as it is customary, local government. Eastern region never had any Oba, apart from Obi of Onitsha or Asaba, they have other chiefs. Western region, Yoruba areas, and also Edo, Ijaw, they had their Obas. Awolowo brought in, he created, he took away the powers they used to have and created local governments, brought in by-elections and made the Obas ceremonial heads. To give like the Queen of England, Queen’s speech on the first day; and they retire, and the elected chairman and elected councillors carry out their functions at Local level. For the regional government, it was no concern of Balewa as prime minister, what you did in your own region. NO! FORBIDDEN. No go area. So what Murtala/Obasanjo regime did at that time was to distribute the draft to all the state governors, and say make this draft an edict for your state, and you also for your state – comma for comma, word for word, the same. I’m not telling this, I saw them. In my committee on executive at Abuja in 2005, the former governor at that time confirmed what he said. Exactly, he had that draft himself. In fairness, it was still only an affair of each state, to be promulgated as an edit to each state Governor. That was nothing to do with the constitution. Nothing. Did they amend the constitution? Incidentally, Gowon’s government and Murtala/Obasanjo’s government, from the first coup, from the second coup, if I speak of that, not the unitary system which Ironsi introduced, the governments of Gowon and also of Obasanjo were under the 1963 constitution. Land is a state matter. Apart from Abuja, Federal Territory, which the federal government can claim to be its own, it has no land here [Lagos] apart from land compulsorily acquired for public purposes – like roads, land for railways, port authority, NEPA. So it’ll appear to me that there’s lot of illegality being carried out by the federal government with regards to the federal system? More than you can imagine! Unconstitutional actions. Can we outline these unconstitutional practices done by the Nigerian federal government? That’s what I’m talking about. I’ve talked about education. I’ve talked about local government, which, unfortunately, the 1979 constitution has distorted. Let me make one confession, I was one of the 50-minus Awolowo who were appointed to draft the 1979 constitution. But let me assure you, I still have the report of our CDC. We recommended the continuation of 50% revenue allocation sharing. I have the report with me – in two volumes. So they changed it? Who changed it? Well, Obasanjo promulgated the constitution in 1979. After our draft, their draft, I was in the constituent assembly. I don’t think they incorporated our recommendation, because they removed the whole formula and put zero, for National Assembly to decide the way revenue should be shared. Another area I feel strongly about restructuring is to abolish the system whereby we vote for political parties. From 19, well I grew up as a school boy – primary school, secondary school in the 40’s. I grew up in the atmosphere in which people were voted for and we knew the candidates. I had no voting rights as a school boy, but I followed political activities by Democratic Party in alliance with NCNC. Led by Zik, Macauley, before he died in 1947; and ZIk took over NCNC as leader. Nigerian Youth Movement from Dr. Von and his friends, founded in about 1933, about the time I was born, until he passed away, succeeded by Action Group in 1951, until the 1966 when we had this coup, Nigerian voted for human beings. I saw canvassing; as a school boy, I attended political party rallies in Lagos, and saw some outside Lagos. We voted for human beings. Not for APC or PDP parties as we do now. For APC, PDP or PWD or UAC parties, we want to see the person we’re voting for on the ballot paper, all these things don’t help the growth of our economy because people in the world will be saying what type of people are these Nigerians. We’re the only country with parties on ballot papers. In Russia you see human pictures, even in Soviet Russia! The other day, in the US a congresswoman declared candidature for Democratic Party. Human being, it’s not Democratic Party saying they want to stand, we want to see the person. I want to see the person who’s suppose to represent me here, in February, it’s ballot paper with a list of political parties, therefore, you put your impression on. So that is the right, my rights to stand for election, to stand for election as an independent. In Lagos we had independent candidates. In Nigeria we had independent candidates. Today, it’s abolished. You can vote but you can’t stand as an independent candidate. All these don’t make for stability and finally about restructuring, we have today, in the judiciary, the Chief Justice of Nigeria (CJN) is the one to appoint State High Court judges. It wasn’t so when I was growing up. It wasn’t so when I was in Government. Each state had it’s own Judicial Service Commission, and judges of each state, the chief judge had to appear before each state house of assembly. But today, it’s NJC, they paid half of their salaries – that is not federalism, it’s not fiscal federalism either. The states should appoint their judges as we use to do, judiciary is unitary, and that’s not federal judiciary. So, I’d plead the major party should stand up and commit themselves what they want to do and what they’d do if the candidate is elected – would you reform these areas of the constitution, especially the economic, the whole, the judiciary, they should publicly declare. The party should have it in there manifesto publicly, which area they want to reform. That’s the only way I believe Nigeria could play its role in the committee of nations. You also talked about Section 6, sub-section 6 of the constitution. What’s wrong with it? There is that one in the constitution from 1979, repeated in the 1999 constitution, which says that you cannot challenge the competence of the military government or the government to make a decree. So, you cannot say decree passed in the government to which I served is unconstitutional. That the government had no competence to make that decision, you can’t. But that of Murtala, Obasanjo or Buhari first time, or Babangida, or Abacha or AbdulSalam, is still in our constitution today and to me, it encourages military coup, because you cannot challenge the power of the military to make a decree. All these things don’t make for stability of the economy. And they affect the confidence that people have in their governance. Talking about the stability of the economy and then the growth of the economy, what is the role of the rule of law? The federal government will make one law today and another day there’d be another change of rules. How does this affect the economy? Well, as you put it, it wouldn’t encourage confidence in people who want to invest in the country, if they are not sure what laws operate at any given time, they are not sure whether the law you made yesterday is still the law, or the law you made today, tomorrow will remain the law. Unfortunately, we have the penchant in Nigeria for amending laws. Before I answer your question directly, look at the constitution, the American constitution, which was made in 1787, when I made a study of that aspect of the constitution, there were not more than 30 amendments to the constitution form that time. But in Nigeria, if you want to pick your teeth, they say amend section this of the constitution, if you want to laugh, they amend the constitution, if you want to take one step, they amend the constitution, that doesn’t make for stability. Over this past few years, you imagine the number of amendments to our constitution since 1999. We distort our laws, you don’t need to amend your laws every day, every month or every year, let the laws grow. In England, under English system common law, even judges help to make law – precedence, what is now happening, the situation, everything – you say it’s exactly what happened some years ago in this sort of circumstance. If it’s in Nigeria, they’ll say yes, amendments. You have to make your laws attractive for capital to come, because the capitalism everybody practices now, unfortunately socialism is dead – it’s been given wrong name, almost dead. Profit is the motive for business. The state should allow people to make their profits but don’t change the law every now and then, let there be some stability- where people can beat their chest and say, yes, the law as it was 10 years ago, is still there or minor alterations. And it must be in the interest of the Nigerian economy that should be the paramount consideration. I want us to look at how some of these distortions can be corrected, what can be done, what do you advise? What do you suggest, we look at the invasion of state function by the FG, here you listed primary education, Army, Navy, Air Force primary schools. Primary education fund, Primary health care being ruined by, then you’ve, you also have lands. All these are state functions. They have major impact on the economy and they have been taken forcefully by the federal government and states have been left helpless, how can they become conscious that there is a major problem? The state governments should take the federal government to court for invading their political territory, and where the states fail to do so, the ordinary citizen can do so. I did so in the case of a decree promulgated by General [Ibrahim] Badangida, which nationalised even state lands. Remember, any land reclaimed from the sea or lagoon; lagoon means Lagos. Onitsha doesn’t have lagoon, Minna doesn’t have lagoon, Kano doesn’t have lagoon. By that decree, the whole of Victoria Island became federal land. And the decree said even if the land belonged to the state government; and as an ordinary human being, I said to myself, this can’t pass. I invoked my energy that I had when I was 27/30 years old, and said this cannot pass. I didn’t seek nor did I have state government support, I just did it as an ordinary citizen; as I said, the whole of Victoria Island was reclaimed, either from the sea or from the lagoon, Lagos Island itself, part of Isale Eko reclaimed, part of Oshodi reclaimed, Third Bridge reclaimed from Ikoyi, Osborne Road, that’s where you have Osborne estate, reclaimed, Banana Island, recently reclaimed from the lagoon; part of Apapa, Ebute Metta, Yaba to Ikorodu, reclaimed, then I said, what type of law is this? It can’t pass. I went to the federal high court and I won. Do you not think that the way the political structure, by which I mean the political party system is organized, that it tends to remove the ability of say a state under a political party to challenge such laws knowing that a governor, returns to the party after 4 years? That Governor is not fit to be a Governor, he’s not fit to be the leader of men and that’s an area in which Nigeria is in short supply, we don’t have sufficient amount of patriotic leaders in our political system; people who care passionately for the people, the interest of the people. Many of them are concerned with their own self interest. Incidentally, one area is abuse of the political system by all our legislators, national, state, APC, PDP, UAC, PZ parties on this constituency allowance. The national revenue mobilisation commission, set up by law has fixed by law salaries of senators, representatives and house of assembly members of all the states. They still receive theses salaries. Apart from that they have constituency allowances, you know to set up offices in their constituency and have staffs. The money is too much sir, each senator receives N120 million and member of the Federal House, N90 million every three months. To run your constituency with that allowance, that’s okay, that’s allowed under the system, on top of that. And this started during the presidency of General Obasanjo. This legislative house ensures that there is one line vote, constituency projects, so many triggers but no details of expenditure, I’m still one, no details at all, but they now share that money, equally among the senators, equally amongst the house of reps members. Regularly, undeclared, until senator Sani from Kaduna blew the whistle about their salaries. Each assembly also does the same. Nobody questions them about these things, and what do they say they want this money for? For constituency projects, I’ve seen some of them, I’ve heard of some of them who genuinely use part of this money to build classrooms for their constituency, to empower their constituency, I don’t know. You know, to buy 2KVA generators for their constituency, to buy motorcycles, I’ve records of a young politician, and he documented genuinely these performance and brought it to me, but you see, that’s the work of the executive, legislator is not to build classrooms or supply motor-cycles to help the constituency. Empower, they’re not to build hospitals. All these noise about doing this for my constituency, have you read of MPs in England or American legislators or Russian or Ghana legislators or South Africa legislators. This is the role of the executive; your role as legislators is to make laws, nothing more. Execution of the law is the function of the governments. So, if I were a business man, a British business man, you think I’ll come to Nigeria? We that don’t know who does what. A situation in which as I’ve experienced for my clients, a matter in court, a matter in court, and you get a letter or your client showed you a letter from the house committee that you should appear because there’s a complaint by the other side, I’ve experienced it and I said to hell with them. I wrote to them, this is not your business, matter in court, this is how we distorts the full system which also has an impact on the economy of the country. Again, like restructuring, I’m looking for the day, these coming days before this national election, in another two weeks, is it? I want the major political parties to declare that when the party wins elections, I want PDP to declare, I want APC to declare, that they’d banish constituency projects. So, it’s not for a governor to want to sit tight and say being a governor, I’m entitled to second term, no. Your party will decide for you, it’s only in Nigeria with this sort of thing which does not make the economy attractive to foreigners. So, like restructuring, I’m praying and begging the major parties to say, when they win power, even if you don’t win power, that henceforth, your members will not receive or support constituency projects, because it’s not your business, it’s the business of the governors, the presidency to provide those for the population.